Oh, those wonderful summer tomatoes! 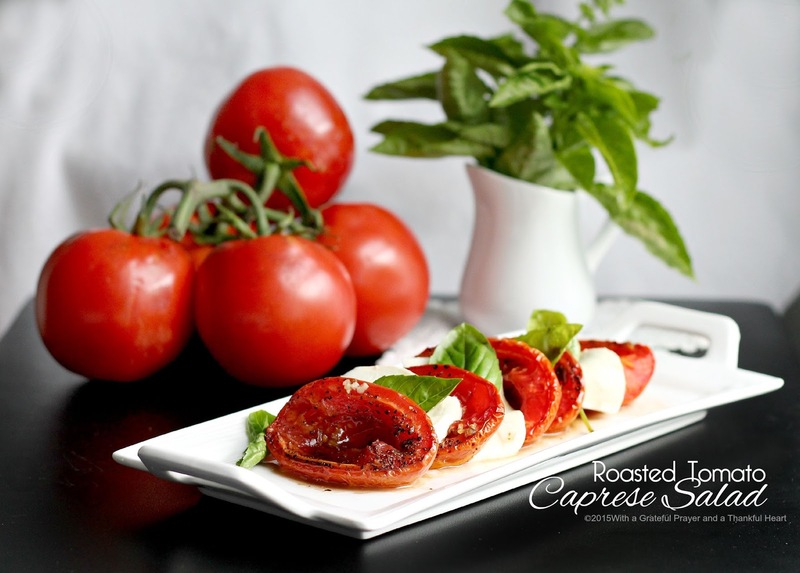 Long, slow roasting with olive oil, garlic and balsamic concentrates the tomato flavor for a lovely caprese salad. Plum tomatoes, either from your garden or the market are used in this recipe. 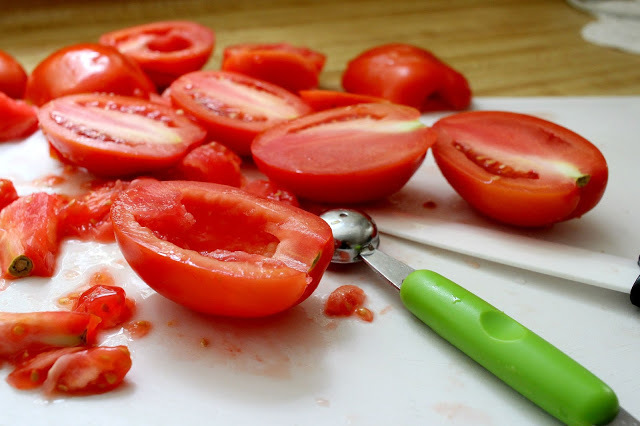 Slice tomatoes in half and scoop out the seeds leaving some of the core. Add chopped garlic; sprinkle with sugar, salt and lots of black pepper. Roast in a slow oven (275 degrees) until the tomatoes are concentrated and begin to caramelize. 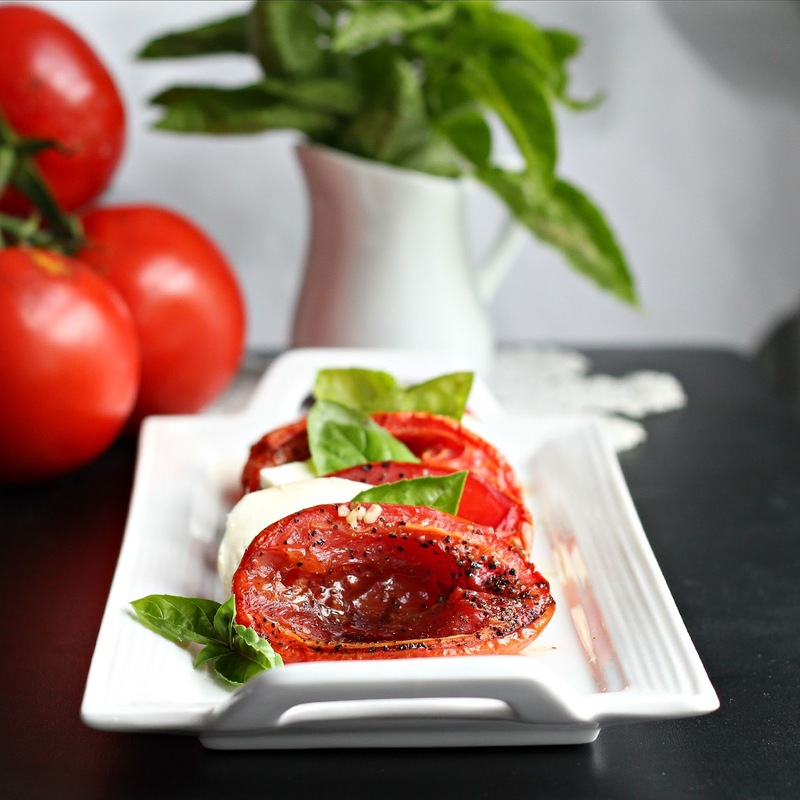 Arrange slices of mozzarella and basil leaves alternately with roasted tomatoes on plate. 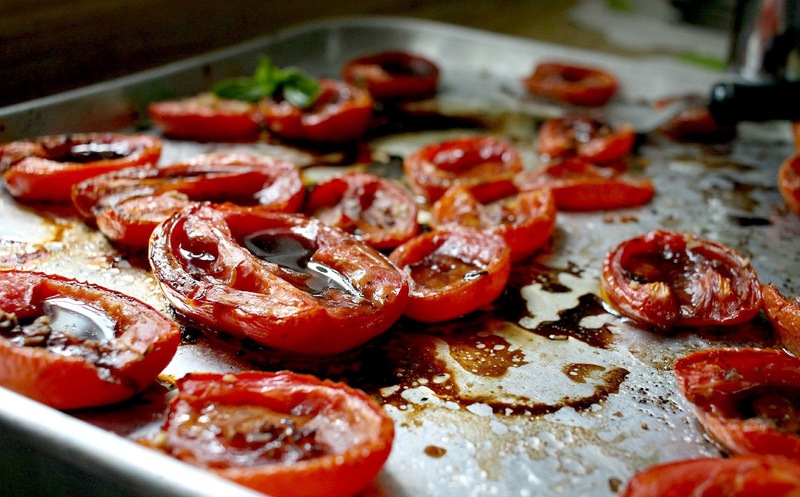 Arrange the tomatoes on a sheet pan, cut sides up, in a single layer. 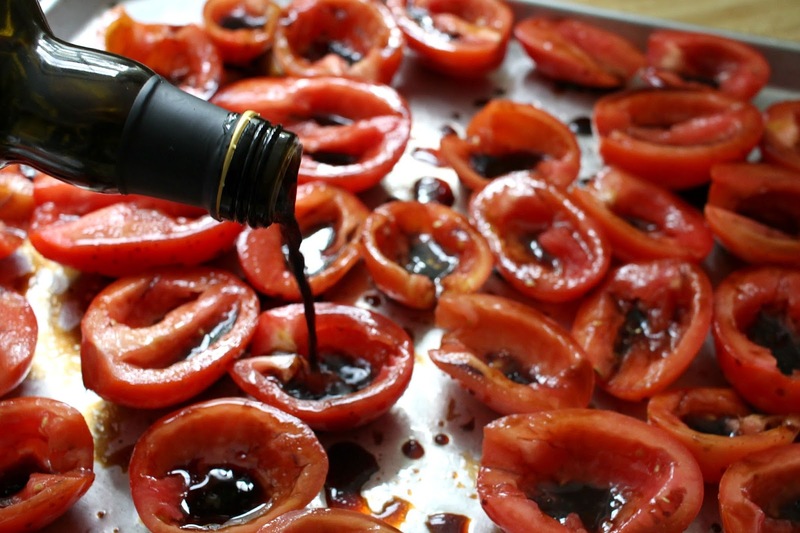 Drizzle with the olive oil and balsamic vinegar. Sprinkle with the garlic, sugar, 1½ teaspoons salt, and ½ teaspoon pepper. Roast for 2 hours until the tomatoes are concentrated and begin to caramelize. 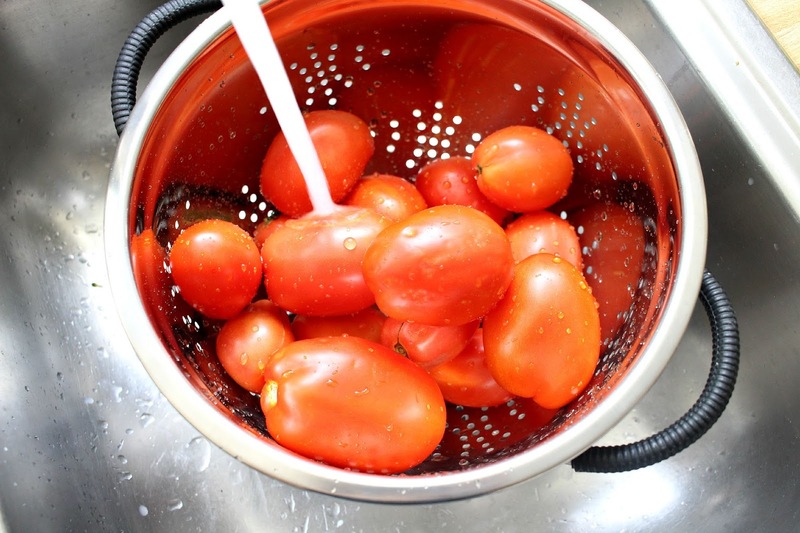 Allow the tomatoes to cool to room temperature. Cut the mozzarella into slices. 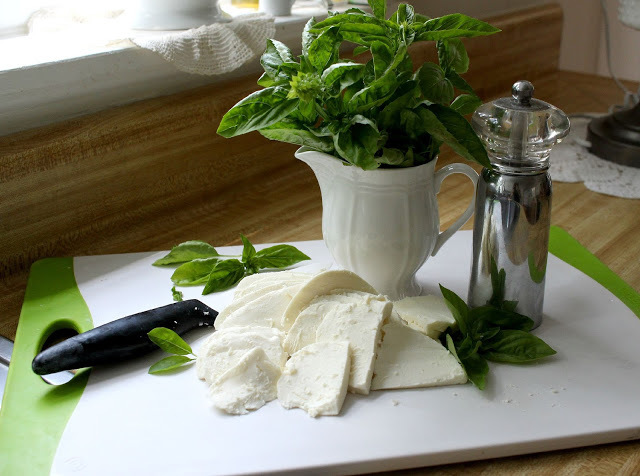 If the slices of mozzarella are larger than the tomatoes, cut the mozzarella slices in half. 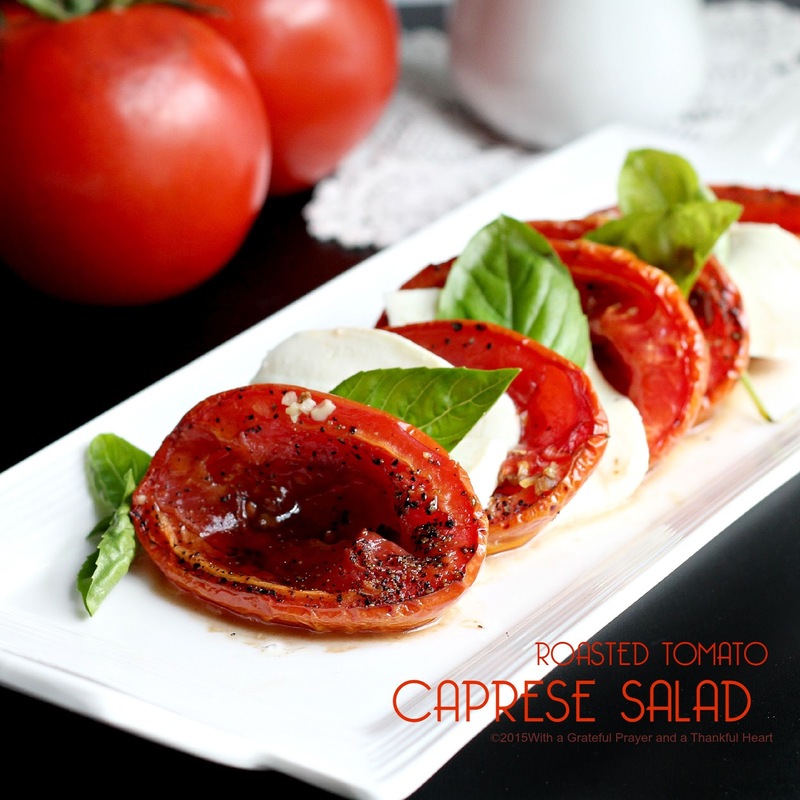 Layer the tomatoes alternately with the mozzarella on a platter and scatter the basil on top. 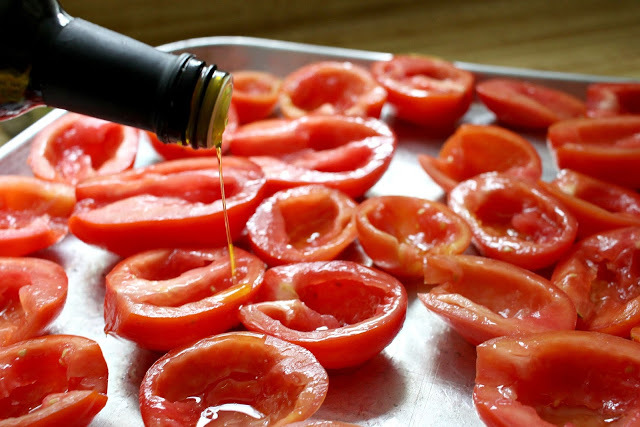 If desired, sprinkle lightly with salt and pepper and drizzle lightly with olive oil. Serve at room temperature. Lorraine, you always share such great recipes. Your pictures are so vibrant. Beautiful work as always. I've been making caprese salad a lot since our tomatoes began ripening, but this version, with roasted tomatoes would be wonderful! Thanks for sharing! oh wow, that looks so good. This looks delicious. Wishing you a great weekend.